Regional Australia has become the new competitive focus for domestic carriers in the wake of Virgin Australia’s acquisition of Skywest in Western Australia and moves by Qantas to firm up its position in the East. 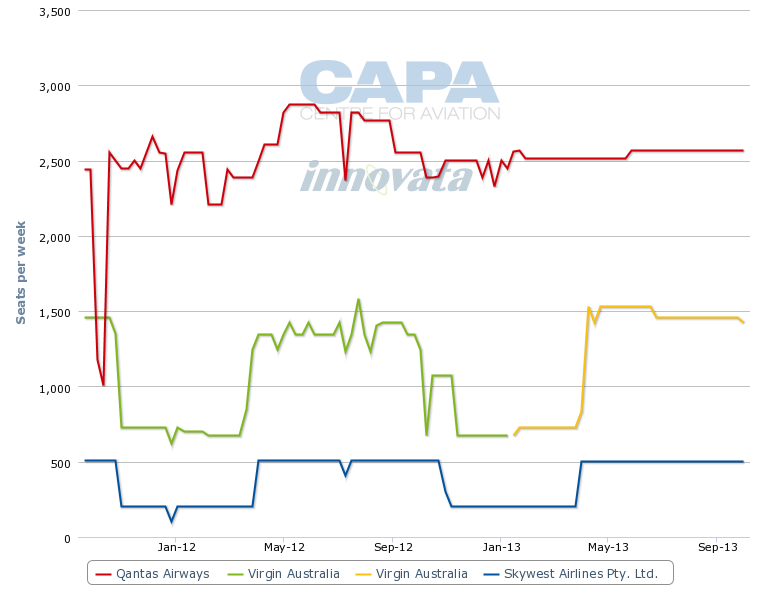 Skywest has provided Virgin Australia with a much needed boost to its regional network allowing it to better compete with Qantas. Regional traffic is growing but Virgin Australia’s efforts to enter some markets are being hampered by regulatory restrictions on many routes in the interest of service stability. Virgin Australia has already intimated that it could move its headquarters from Brisbane in frustration at a decision to delay tenders for regional Queensland routes until 2014. Qantas is responding to the renewed threat of increased competition on its regional network, having added another four Bombardier Q400 turboprops to its fleet. It will take delivery of more regional aircraft in 2H2013, including another five Boeing 717s, to bolster capacity. 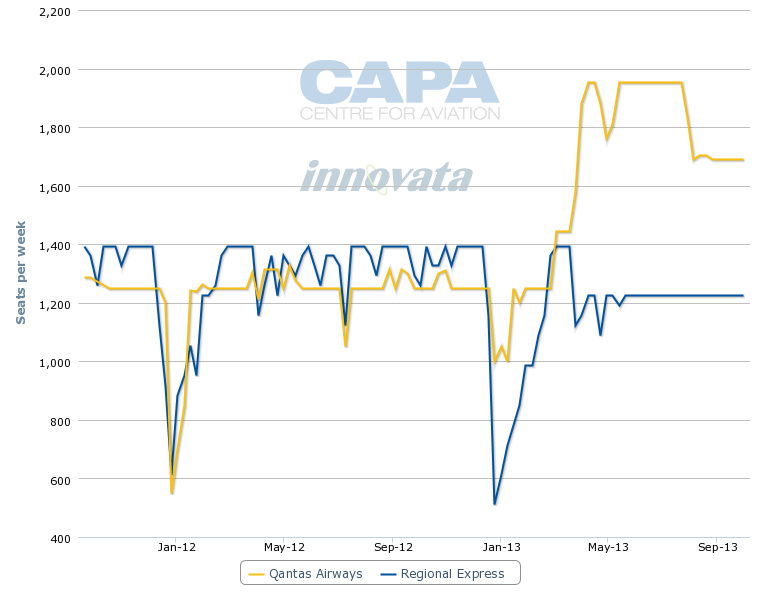 Meanwhile, Australia’s biggest regional carrier, Regional Express (REX), is suffering from reducing passenger numbers and even bigger cuts to its profits, blaming government policies for increasing costs and reducing demand for regional air travel. Australia’s regional services have maintained steady growth with total passenger movements at regional airports increasing from 22.5 million in 2010 to 24.4 million in 2012, continuing a 10-year trend. Over the past five years total passenger movements at regional airports has grown an average of 4.6%, outperforming average growth at major city airports of 3.5%. More than nine million passengers passed through airports in each of inner and outer regional Australia in 2012 with both regions experiencing average annual growth rates of 3.3% and 4.4% respectively between 2007 and 2012, according to BITRE data. Air travel between major cities and regional areas accounts for more than 90% of the entire regional aviation market, according to the Department of Infrastructure and Transport. Qantas offers the broadest network with 54 domestic destinations while REX offers a network of 35 points mainly in New South Wales but also has a strong presence in Queensland as well as South Australia. Virgin Australia’s acquisition of Skywest adds nine new Western Australian destinations to its scheduled services network, taking the airline’s total domestic network to 42. Each of the three carriers has a leading position in one of Australia’s states. Qantas is strongest in Queensland with a network of 22 destinations. Skywest has given Virgin Australia the lead in Western Australia with 14 destinations. And REX has the largest network in New South Wales covering 18 destinations, albeit only just ahead of Virgin Australia. Western Australia will be the scene of the biggest competitive shake-up of regional Australia, at least in the short term. Qantas dominates the Western Australian market, offering more than double the capacity of a combined Virgin Australia/Skywest from Perth to regional destinations. Qantas operates scheduled services to eight destinations in Western Australia from Perth to Broome, Port Hedland, Karratha, Learmonth, Paraburdoo, Newman, Geraldton and Kalgoorlie. The carrier operated 227 direct frequencies from Perth on that network in the week of 15-Apr-2013 to 21-Apr-2013, totalling about 63,300 seats. The biggest route by seats is Perth-Karratha with 17,850 seats followed by Newman with about 12,000 seats and Port Hedland offering about 11,800 seats. However, the acquisition of Skywest has almost doubled Virgin Australia’s Western Australian regional capacity direct from Perth by adding Skywest’s approximately 11,700 seats for the week of 15-Apr-2013 to 21-Apr-2013 to its own of around 13,300 for a total of about 25,000 seats. Together, Virgin Australia and Skywest operated 135 direct frequencies from Perth to 14 regional points in the state, including 86 flights operated by Skywest. Virgin Australia’s scheduled network from Perth covers Karratha, Port Hedland, Broome and Newman. Skywest adds Kalgoorlie, Geraldton, Albany, Esperance, Derby, Learmonth, Kununurra, Busselton and Ravensthorpe and Broome which is the only destination that both airlines operated before the merger. Virgin Australia’s Perth-Karratha service is also its biggest route in Western Australia, offering 4,150 seats per week followed by Port Hedland with about 3,870 seats. Perth-Broome has a combined capacity of about 3,850, including 1,000 seats from Skywest. Virgin Australia inherits Skywest’s ATR 72-500 and -600 fleet which already flies under its colours on regional routes on the east coast from Brisbane to Emerald, Gladstone, Moranbah, Port Macquarie, Rockhampton, Townsville and Cairns. From Sydney the ATRs operate to Albury, Canberra and Port Macquarie. In addition Virgin Australia operates a fleet of Embraer E190 regional jets nationwide across Australia, while Skywest also operates a fleet of F100 and F50 regional jets throughout Western Australia, as well as an A320. Skywest has another five ATR-72-600s on order with the next one due to be delivered by 30-Jun-2013. Additional A320s are also being considered, even though the type is not operated by Virgin Australia, which has an all 737-800 and -700 narrowbody fleet along with its ERJ190 regional jets. Virgin Australia has appointed seasoned executive Merren McArthur to head its newly formed Virgin Australia Regional Airlines (VARA) Group. Ms McArthur replaces Skywest CEO Jason Bitter who along with CFO Brian O’Dwyer and most other executives, particularly those based in Singapore, have either left or will soon leave the airline. As part of the Skywest integration the entire regional fleet will be rebranded in Virgin Australia livery, but will retain its own AOC. The two carriers have in fact been working together for more than 18 months bidding jointly for charter contracts. Virgin Australia will use Skywest to accelerate its expansion in FIFO and regional markets as well as supporting its aim of gaining a larger slice of the corporate and government market. Virgin Australia will launch daily Brisbane-Bundaberg services from 04-May-2013 using ATR 72 aircraft in competition to Qantas, which has had the route to itself for more than 10 years. Virgin Australia will offer 476 one-way seats per week against Qantas’ approximately 1,600 one-way seats across 28 weekly frequencies using a mix of Q300 and Q400 turboprops. Queensland, New South Wales, South Australia and Western Australia regulate intra-state air routes by limiting competition on low volume routes through tender-based licensing systems. The states argue that the system provides greater stability of services and encourages route development. Higher volume routes are largely not regulated. However, Virgin Australia points to routes such as Cairns-Weipa and Brisbane-Roma, which are among 30 regulated routes in Queensland, where demand has increased to a point that it wants to compete with Qantas. Qantas has increased capacity on Brisbane-Roma to about 2,900 one-way seats per week from about 1,700 in Apr-2012. Capacity on Cairns-Weipa has been stable at around 1,000 weekly seats. Virgin Australia has indicated it will instead accelerate its growth in other parts of regional Australia other than from Brisbane. Qantas announced in Jan-2013 that it would expand the group’s regional fleet of 65 aircraft to capitalise on growth in Australian domestic markets. The carrier will lease an additional five 717s and purchase three Q400s, which are due to be delivered from 2H2013. The 717 fleet will increase to 18 aircraft and the Q400 fleet to 31. Qantas CEO Alan Joyce said the new aircraft would strengthen the carrier’s domestic network and grow business travel between major centres and regional destinations, as well as in the fast-growing intrastate markets of Queensland and Western Australia. Qantas is increasing capacity on routes in New South Wales from Sydney to Tamworth, Armidale, Coffs Harbour and Dubbo in Apr-2013 to secure its competitive positions and help win more business traffic. Tamworth and Dubbo each received an additional eighth weekly frequencies, taking them to 36 and 29 frequencies respectively. Some Sydney-Dubbo services have also been upgauged from a 50-seat Q300 to a 74-seat Q400. Qantas has a monopoly on the Tamworth route even though it is not regulated. On the Dubbo route the airline competes with REX which has reduced some frequencies in protest at the airport’s owner, Dubbo City Council, introducing passenger security screening charges that are not a legal requirement for its 34-seat Saab 340 turboprops, but have been implemented to cover Qantas’ Q400 services. The removed capacity was to be redeployed on Sydney-Wagga Wagga. Qantas competes with Virgin Australia and Tiger Australia on Sydney-Coffs Harbour, where it has added two weekly frequencies taking the route to 35 flights per week. Qantas operates its regional network under the QantasLink brand which is operated by wholly-owned subsidiaries Sunstate Airlines, Eastern Australia Airlines and Airlink (Cobham Aviation). Sunstate Airlines is the largest of the four regional subsidiaries. It operates services throughout Australia, using the Qantas Group’s largest and most modern fleet of 28 Q400s. Sunstate also operates internationally to Port Moresby from Cairns. Eastern Australia Airlines is based at Sydney Airport and operates a fleet of 21 Dash 8-200 and 300 series aircraft. Adelaide-based Airlink – Cobham Aviation Services primarily operates a fleet of 13 Boeing 717-200 regional jets from hubs at Perth, Cairns and Brisbane to regional destinations including Alice Springs, Broome, Kalgoorlie, Karratha, Newman, Paraburdoo and Port Hedland in Western Australia; Ayers Rock, Darwin and Nhulunbuy in the Northern Territory; and Gladstone, Mackay and Rockhampton in Queensland. Qantas’ Western Australian FIFO and general charter business, Network Aviation, operates a fleet of seven F100 regional jets and two 30-seat Embraer EMB-120 turboprops. It also operates some scheduled regional services in Queensland from Brisbane to Emerald, Mackay and Rockhampton. Transport NSW allocated regulated route licences for 14 routes from Sydney effective from 30-Mar-2013 for five years. REX was awarded eight routes to Broken Hill, Narrandera, Grafton, Taree, Moruya, Merimbula, Bathurst and Parkes. Brindabella Airlines was granted five routes to Narrabi, Mudgee, Cooma, Cobar and Moree. Brindabella is affiliated with Qantas and operates a fleet of nine BAE Jetstream 41, BAE Jetstream 31 and Fairchild Metroliners from bases at Brisbane and Canberra. Qantas was awarded Sydney to Lord Howe Island in the Tasman Sea, but does not have rights to any regulated routes on mainland NSW. REX operates a fleet of 47 Saab 340s on some 1,300 weekly services to 35 destinations throughout New South Wales, Victoria, Tasmania, South Australia and Queensland. The airline also competes in the FIFO market, including a contract with Ivanhoe for Osborne and Mount Dore mines. REX has struggled to maintain profits as it grapples with falling demand and rising costs which saw its 1HFY2013 profit after tax plunge 32% to AUD9 million (USD9.4 million). Passenger numbers were down 5% to 577,837 while load factors dropped 3% to just 56.8%. Profits for FY2013 are forecast to be 35-40% below FY2012, which the airline blames on government policies which are damaging to regional airlines. REX executive chairman Lim Kim Hai said in Dec-2012 that: "From the very first month of this financial year, we are seeing the catastrophic impact the various draconian government policies are having on regional aviation. Not only have the policies like the Carbon Tax increased cost significantly, there has also been a significant drop in passenger numbers due to government policies exacerbating the effects of a fragile global economy." For Virgin Australia the takeover of Skywest is significantly more important to its domestic growth prospects, as underlined by the steady increase in regional travel, than its attempt to buy a 60% stake in LCC Tiger Australia which awaits approval from the Australian Competition and Consumer Commission. But Qantas will prove to be a formidable opponent and is taking aggressive steps to defend its position. The resulting increased capacity and competition, in particular for the business traveller, should bring lower fares to the regions as it has done between the main centres since Virgin Australia launched its strategy to gain at least a 20% share of the corporate and government market.